When it comes to giving your bathroom a character all its own, there are lots of options to choose from. You can repaint it, install a new mirror, put in a trendy vanity, or re-tile it to better suit your sense of style. 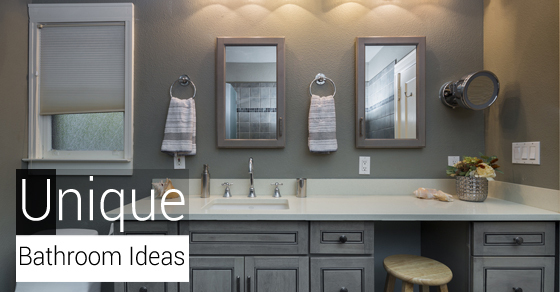 While those sorts of updates will work, you might want to think outside of the box and make your bathroom stand out from the pack with some head-turning accessories. Here are four unique bathroom accessories for you to consider. You probably already sing in the shower, so would it be a stretch to scribble down notes there as well? You can do that courtesy AquaNotes Waterproof Notepad. Whether you’ve come up with the answer to a nagging conundrum or you’ve thought up something to add to your to-do list, you can do that in the shower. AquaNotes Waterproof Notepad has suction cups so that it can be affixed to the tiles, which means you won’t have any more excuses for forgetting your great ideas. When you’re done showering, you can rip off the sheets you’ve written on and take them with you. With the Shower Sponge Microphone, you can belt out your favorite tunes in fine style. This sponge is actually shaped like a microphone, so you can use it to give renditions of your favorite tunes. Between sets, you can use the sponge to soap up and scrub away. Since it’s not a real microphone, you won’t have to worry about electrocution or any other potential safety hazards. If you like to get every bit of toothpaste out of the tube before throwing the tube in a waste bin, you’ve probably at some point taken a pair of scissors to a near-empty tube just so that you could scrape away every last bit. Now there’s a better way to get all of your money’s worth. The Toothpaste Squeezer is a device you affix to the wall. It compresses your tube of toothpaste and winds back with each squeeze of the tube. When you take a bath, wash your face, or style your hair, you probably store your rings on the vanity counter, the bathtub ledge, a shelf, or maybe even in your packet. With a Jacks Ring Holder, however, you’ll have a more trendy and stylish way to keep your rings in a place where you’ll easily be able to track them down. The accessory has six legs, upon which you can stack as many rings as you want. It is made of zinc with a chrome finish and looks a lot more interesting than does a traditional jewelry box. As you can see, there are some off-the-wall accessories out there that can really make your bathroom stand out. Use your imagination, and give your bathroom a unique vibe all its own.